Traveling cat spotted on Bloemenhofplein / Place du jardin aux fleurs in Brussels, Belgium. Listening to the name of Misty, this cat belongs to writer/filmmaker Gert Verbeeck. His latest is a contribution to the reference work HIDDEN HORROR: A CELEBRATION OF 101 UNDERRATED AND OVERLOOKED FRIGHT FLICKS. we do love the Belgian kitty! That looks cold there- good thing I'm in Florida! Great picture and Happy Valentine's Day! Beautiful Misty! Belle de fenêtre :) . Pretty Misty sure has a great vantage point of the streets below! Lovely cat, not into horror. The kitty, of course, steals the show! But I do love those books. Missed your blog. Been very busy - no time to read or post or comment. Lovely kitty. Have a super duper weekend. Cheers!! My wife and I both follow your cat post. What a wonderful view that kitty has! The cat says: Mine. All I see before me is MINE! 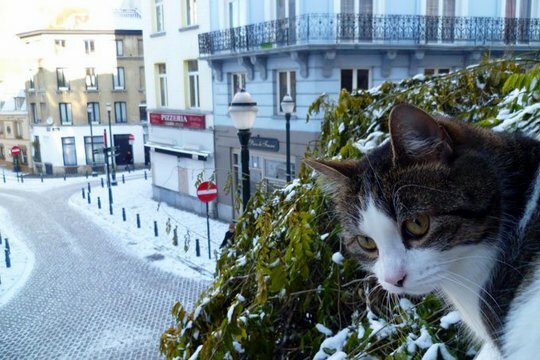 Jolie photo de Bruxelles ... et tellement plus animée avec un chat !!! Happy cat in the land of chocolate and beer (so, a good place to be). La concierge à sa fenêtre ou bien le veilleur ... c'est celon. J'aime beaucoup la couverture du livre avec les monstres. What a cute cat! I wonder what it's like to live in Belgium?